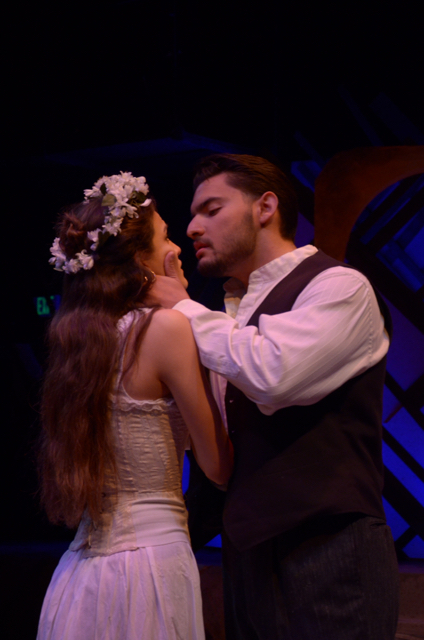 Last night I went to see Fullerton College’s production of Federico Garcia Lorca’s Blood Wedding. Lorca’s tragic tale of an ill-fated wedding got its inspiration from gruesome newspaper clippings from southern Spain, and we are led to believe Blood Wedding occurs in a similar location. We in the audience are transported to another time, place, and culture through the use of dual-language storytelling techniques. The back and forth dialogue of Spanish and English is entertaining and effective in telling a story that is, while occasionally confusing, ultimately enjoyable. In a small town in Spain a young Bridegroom has a conversation with his mother about marriage. He seems nice: smiling, friendly, and dutifully caring for his elderly mother’s needs. There are definitely worse men to marry. However, Mother is anxious about the prospect of his leaving her since her husband and elder son have already fallen victim to violence from another family. Nevertheless, she eventually agrees to be supportive of his upcoming nuptials to a young woman who is rumored to have been in a previous relationship with the family of Mother’s husband’s killers. When they finally go to meet the Bride, the Mother’s qualms seem to vanish because the beautiful Bride is charming and content with the situation. But is she really? As the story progresses we discover the truth of the Bride’s current situation and the natural causes of it. The beauty of the stage cannot be understated. Given the title of the play, it’s unsurprising anyone wouldn’t anticipate a heavy use of the color red at one point or another. For the majority of the first act and part of the second act the stage is awash with red light. However, this is not grotesque. In the first act the scenes are lit with the kind of red that brings to mind the warmth of sunsets and hope. This is suitable for a plot line that focusing much of its attention on home, life, and nature. The stage itself is stacked a few steps up, one on top of the other, with a higher balcony serving as decor for much of the show. The audience is placed on either the same level or higher than the stage on bleachers, so seating is solid. Occasionally walking behind the bleachers, the cast whispers lines of dialogue to help set the mood for the scenes. While the attempt is certainly appreciated, it is also distracting. Fortunately the cast doesn’t do this too often. Special mention goes to Krystal Navarro (Bride) and Abel Miramontes (Leonardo). Navarro is sufficient in both her charm and pain as the Bride, while Miramontes is believable in all of his conflicts. Both performers keep the audience’s attention every moment they are onstage. The play is executed very well, and while I understand not everyone speaks Spanish, monolingualism in and of itself will not prevent you from comprehending the story (my husband went and had no trouble). For starters, they do speak English at least fifty percent of the time, probably more, although I did not count every line. The songs are done almost entirely in Spanish, but they are not sung often. 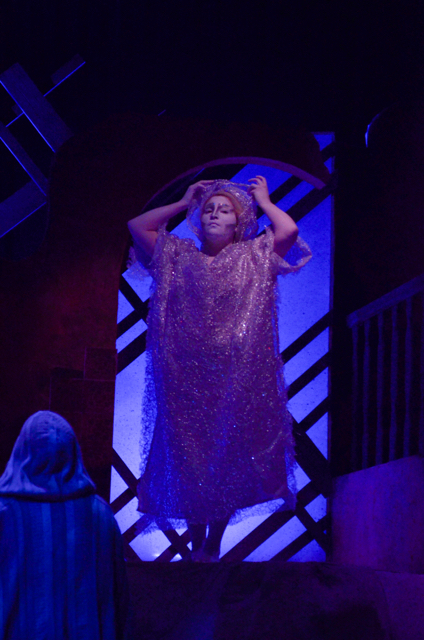 And during the first act the performers are extremely expressive. They are expressive during the second act as well, but the beginning is much more classic and familiar to the American audience as a whole, so even if some lines don’t make sense to you, you can easily piece together what is happening and follow along without feeling left out of the experience. This is in stark contrast to Act 2, which has much stranger things taking place, and is a bit harder to follow along with. Heck, even a fluent Spanish speaker might spend a few minutes going “…What?..what?…random.” Never fear, the end of the show clarifies it all, so it is definitely enjoyable for people–no matter what language they speak at home.